Our goal here at Trayer Designs is to provide top quality web design service for small to medium sized businesses, organizations and those individuals who are seeking to enter the e-commerce world. We are dedicated to implementing the very latest in website design and development technologies at a price that is easily affordable. 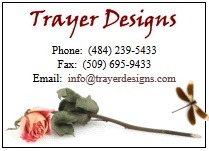 With Trayer Designs you will receive website design, hosting, promoting, maintenance, search engine optimization and so much more. Our clients are not numbers, they are greatly valued and known by name. Additionally, we use the latest software in the development of our projects. If you are serious about your web project and wish to deal with a company that takes great pride in their design service and has an intense desire to see you succeed in your endeavors, please contact us and allow us to issue you a website design proposal or use the link above..